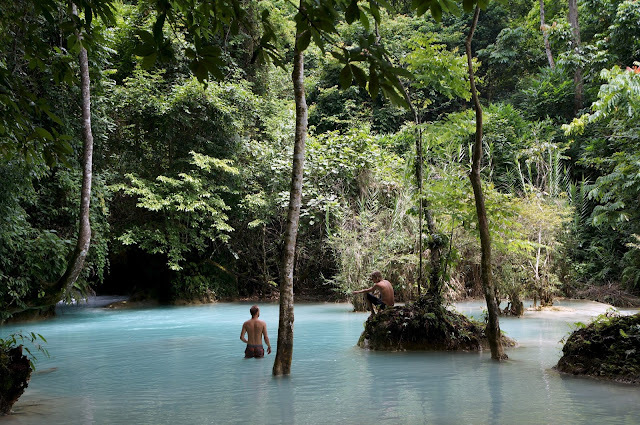 Laos is one of the countries I wanted to tick off my list before going home. It's tricky; there are points of interest sprawled across the country but not enough infrastructure to help me get the most out of it in least amount of time. As much as I would love to trek the northern regions, it's rainy season afterall. So I honed in on Luang Prabang, Friday evening outbound via Vientiane and back on Sunday morning, giving me 1.5 days - solo. The flight from Vientiane to Luang Prabang took around 45mins. The small airport was easy to navigate. There is a stand near the exit where a guy sells you a seat on a taxi for 50,000kip, then the driver group people with similar distance on their cars. It was effective enough and delivered me to my guesthouse door. It was already getting dark by the time I settled down. So I went to the main street (Sakkaline Road) lined with hip and beautifully decorated restaurants and kept walking towards the night market. It was quite a large market, selling the usual souvenir ware, though they seem to be of a higher quality than the wooden junk we see in South East Asia. I thought the pillow cases and duvet covers looked quite good, and the lacquered plates, but no way I was adding those to the list of things to bring home. The food market branches off near the end of the night market. 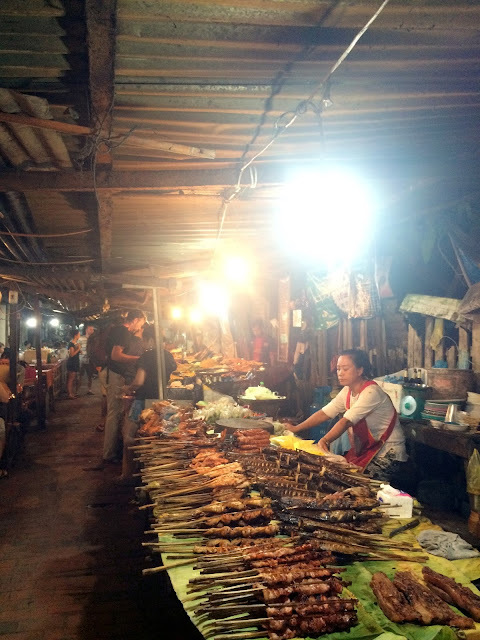 It's a short alleyway with lined local snacks, barbecued meat and cheap vegetarian buffet. I ruled out the bbq, it's the same thing everywhere; burnt, dried meats that haven't been marinated well. If it has been marinated, then one should start wondering how long that piece of meat had been sitting at room temperature in a hot country. Only good quality meats can go without marinades, and I don't think Laos is famous for their meats. The vegetarian buffet looked depressing enough, trays of cold stir-fried vegetables in an array of thick gravys and once deep-fried anything wrapped in a batter blanket. It's 15,000kip for a bowl then you could pile it up once - it just didn't look right. That said it was quite popular with the young tourists. One thing that I was very pleasantly surprised by, was the relative lack of flies. It could be down to seasonality, but really, no flies infesting the foods on display. The local stuff, on the other hand, I was most intrigued by, partly because a lot of locals were going for it. Each dish was 5,000kip; the lady packs a few big spoonfuls into a a clear plastic and tie it up to takeaway. 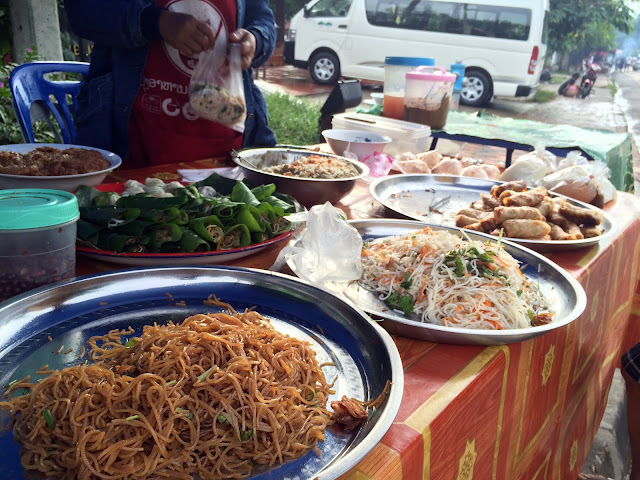 Locals tend to order about 5 different dishes, then some sticky rice from the bucket to take home. I went for the green papaya salad, pigs liver and 2 Laos pork sausage (sai oua). Everything was delicious! 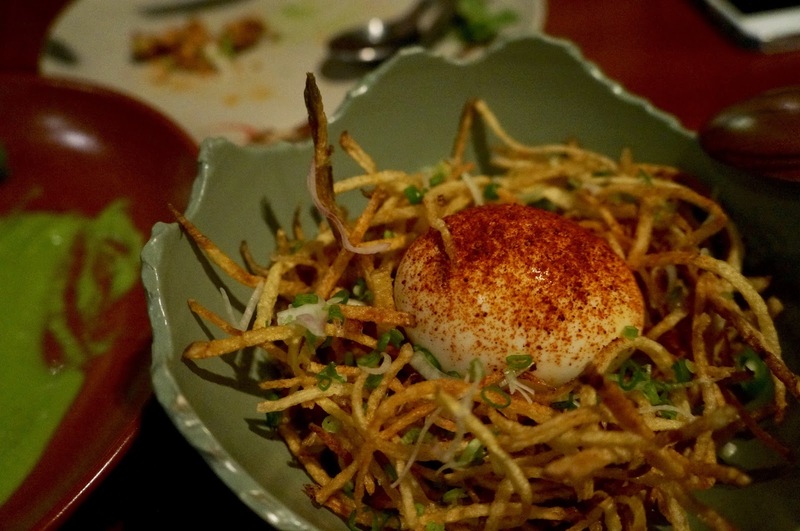 The salad was not dissimilar to the ones from Thailand, sweet and tangy from the tamarind, lime juice and fish sauce. 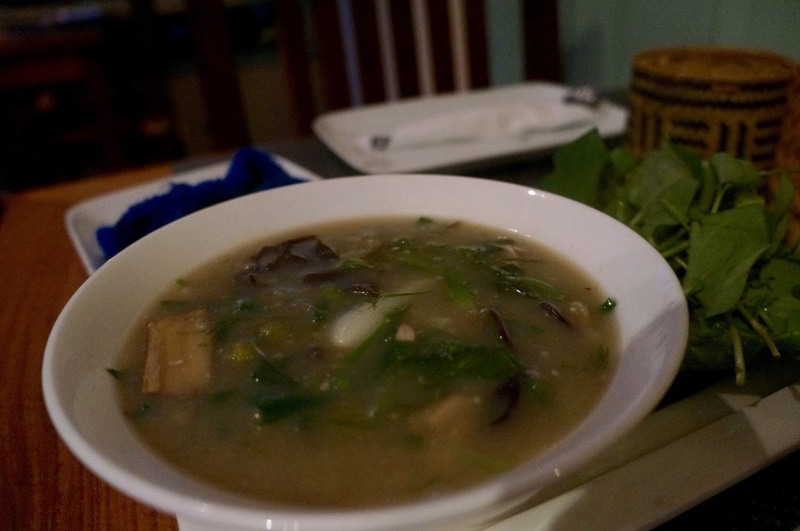 But the Laotian version was slightly more pungent with their fermented fish sauce and had more ingredients in the mix. The liver dish isn't for everyone, but it's was springy with ginger fragrance as opposed to the usual grainy and coarse textures. The sausage... It's sinful. The crispy skin was glazed generously with honey (or whatever sweet syrup they use here); my first bite revealed a wedge of lard, and I kid you not, it was like a pig got stuck in that sausage. The translucent fat was oozing piggy grease and melted in mouth, mingled with the sweet glaze. It was so good but so bad. After pigging out on snacks, I saw a couple of noodle stalls like the ones in Vietnam, servings khao soi (a spicy northern Thai rice noodle) and pho-lookalike. It was alright, MSG for sure and nowhere as good as pho. I left it when I was sure the main flavouring was MSG. Then it was an early night to prep for the cycling to KuangSi waterfall next day. I didn't start as early as anticipated. Rented a mountain bike from Tiger Trails and started the 33km ride to KuangSi Fall at 8:25am. People say it usual takes 2.5hrs outbound and then perhaps 2 hours for the return leg as it was coming downhill. Some people also ride out and then get a tuk tuk back. The first 13km was relatively easy, cruising out of town with light traffic, minor undulations but nothing strenuous. Then suddenly at the 14th km, I realised I had been going up a gentle slope in the last stretch, the gradient got a fair bit steeper and I had no leverage to keep the upward push going. It was a gruelling kilometre and a half, felt like 10km. But it gets better straight after this climb, so stick through it - walk, push, crawl, pray - whatever. Then it was an awesome downhill roll. As much as I was loving the thrill and the breeze, a small part of my brain reminded me that my sorry arse will have to climb this stretch on my way back. The sun started to shine through the clouds. The rest of the journey quite manageable, passing small villages and small temples. Until the last 5km - almost the entire strip was an uphill climb. I hate to admit it, but I had to walk to the last km, and even that was testing. I made it in just under 2 hours, very chuffed. KuangSi waterfall was worthwhile. The first part was a bear sanctuary. I still don't know how I feel about confining animals for display, even though they are doing good work saving them from heartless merchants that extract their bile juice for unproven medicinal purposes. Anyway, that's a different topic for another day. There was a path at the top to walk around the top of the fall, with small bridges to cross the water. A sign pointed towards a cave and a spring 3km down the road. I guess that's where the secret pool with very few people is hidden. I asked a few people coming back from that path and they all said they gave up half way. In my head, 3km is a 30min walk; the two girls I spoke to said 'oh 3km isn't far at all! 1km only takes a couple of minutes'. Say what?!?! Good thing I didn't bother. The moment I got back down to the falls, it started raining, and it kept raining harder. I took shelter in one of the restaurants at the entrance, had a pork baguette that had mayonnaise as the main filling. It was bucketing - I couldn't see beyond 3m. It went on for about 20mins, the rain stopped to spitting but I could see grey clouds still gathering. The sensible thing to do would be getting the tuk tuk back, but I would have missed out on all the ascends I took on my way in, and only partially accomplished the little challenge. Despite the light drizzle, I thought I could race the clouds back to town. Ha. Nah. The clouds were much faster. The first 5km was sensational. Perhaps bordering on dangerous, but sensational regardless. Then the rain caught up fast though it was nothing like the torrential storm before; I was soaked. Things were fine until the deadly climb at 15km from LP. I had to walk it, swear the bike was going backwards despite my best efforts. An accident happened as I was on the downhill slope that followed. Think I underestimated the speed I was going, applied the brakes too abruptly at a sharp bend and skidded off. Nothing major, just scratches and scrapes plus some mud... The rain would wash it off. With the chain hooked back on, I made the return trip in 1hr 25mins. That's damn good time. It was only 2:30pm, I could have taken the bike around town but my legs said no. 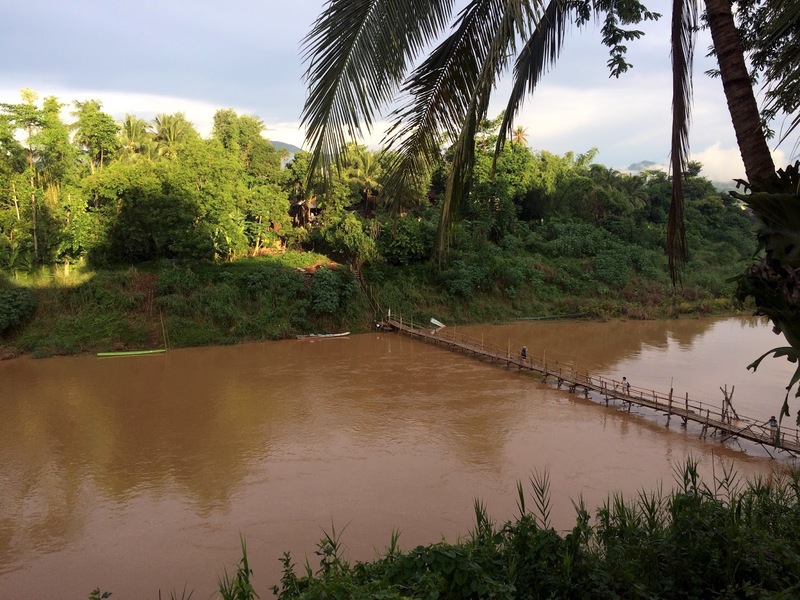 The rain continued in Luang Prabang, not that it mattered as I was soaked through anyway. On my way back to the guesthouse, at the end of the night market street, there were a few food stalls that operated during the day. One of them had some scooters waiting, so I decided it had to be popular. I chose one of each of the 3 leafy parcels and a portion of white noodles. I wish I could tell you what were in the parcels, I have no idea, each one was different but they were all scrumptious - herby, aromatic, good balance of textures. After a hot shower, futile attempts of drying my pants and picking the sand from my wounds, the rain subdued. I set out to Wat Xieng Thong, the oldest temple in Laos. 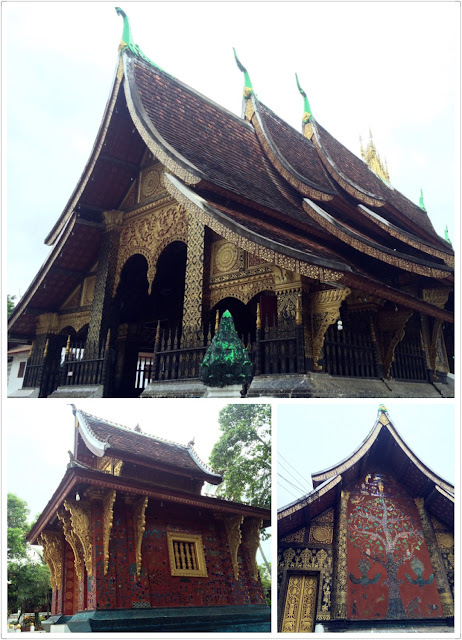 The temple is beautifully adorned with colourful shiny mosaic, and plenty of gold-plated Buddha statues. Perhaps not as big as the ones in other SE Asian countries, but an elegant building nonetheless. Then I strolled along Mekong river with a mango & pineapple fruit shake in hand, the street was lined with eateries that ranged from bbq buffet to high end European restaurants. 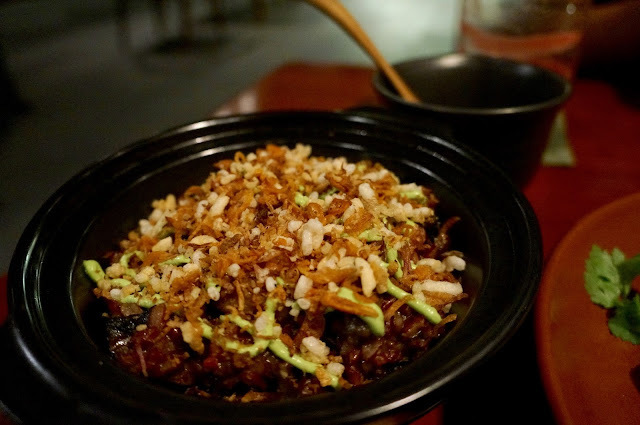 For dinner I circled back to Tamarind near Bamboo Bridge, a place that is consistently recommended by travellers. Lucky I arrived at 6:30pm as soon after I was seated they had to turn walk-ins away. 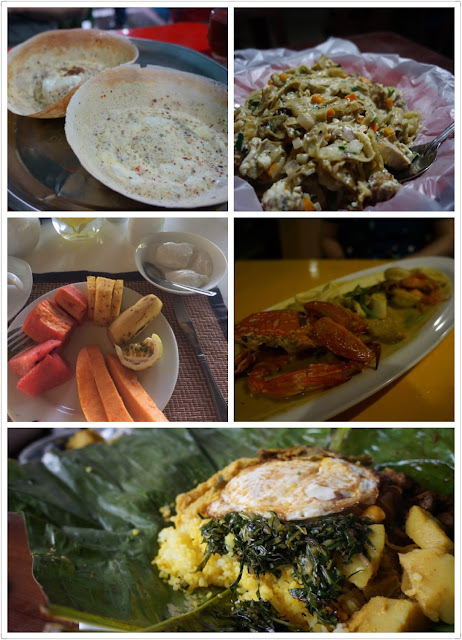 I used to think Laotian cuisine was similar to Northern Thai. 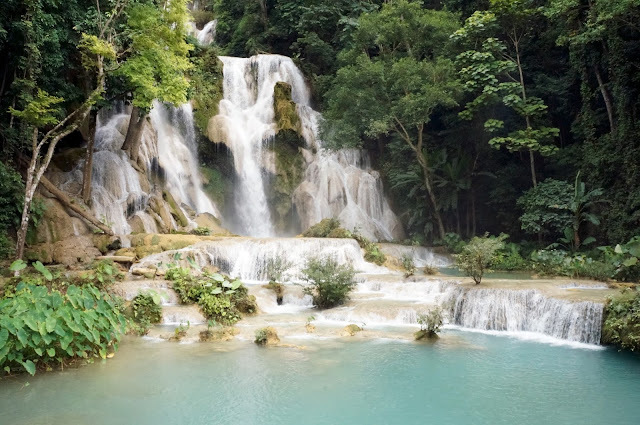 Turns out Laos used to occupy that part of Thailand and so had previously influenced their cuisine, but as Thailand developed and introduced more variety of ingredients, their dishes have evolved to be more watery, like their curries, and deviated from the sticky rice staple. 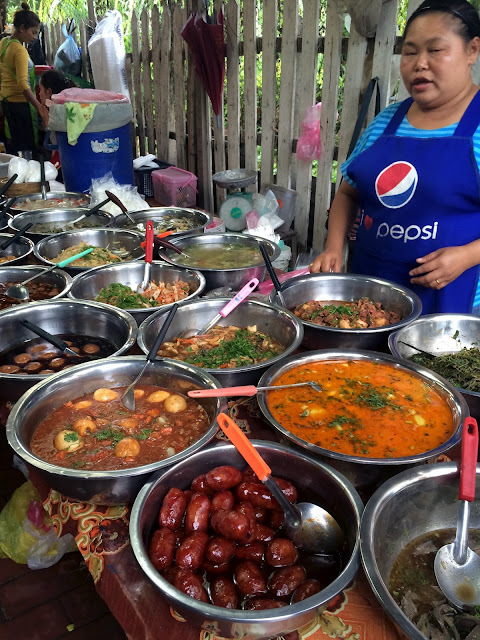 Whereas in Laos, sticky rice is paired with dips because people eat with their hands. With that I ordered the dip 'jeow' sampler. 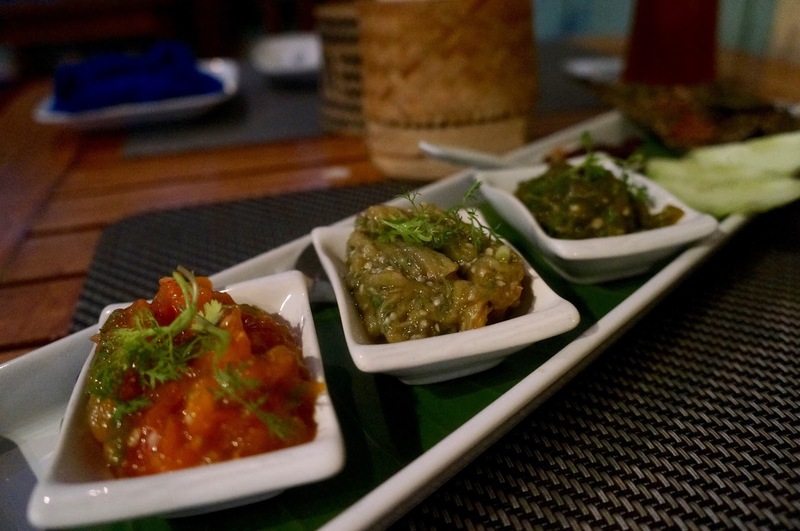 The dips included a tomato-based salsa, smoky aubergine, coriander purée and a sweet chilli paste, served with roasted seaweed and sticky rice. 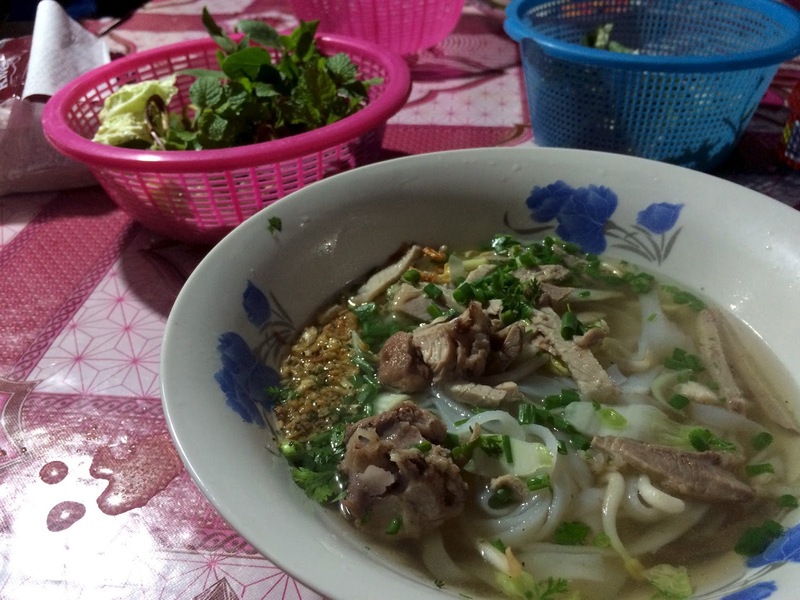 The server explained thoroughly that people in Laos eat with both their hands. They usually grab a handful with their left, pick a bit of rice with their right hand from it, shape and squeeze into a ball before dipping it into the sauce. Well, with the fresh scratches on my right palm, I could only shape small balls of rice with my left hand straight from the woven basket. My favourite was the coriander and aubergine. The latter reminded me of baba ganoush, but smokier. I also ordered a 'orlarm', which is a typical family stew in Luang Prabang with chicken, aubergine, chill wood and a bunch of local greens. It was comfort food, and it hits the spot after a long day. I really enjoyed Tamarind. Shame I couldn't try more of their menu. 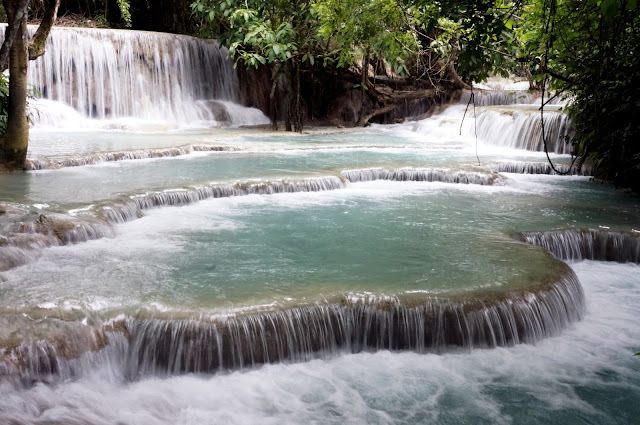 They also have comprehensive information about Laos cuisine and their culture at the back of the menu. If I had an extra half a day, I would definitely have joined their cooking class. 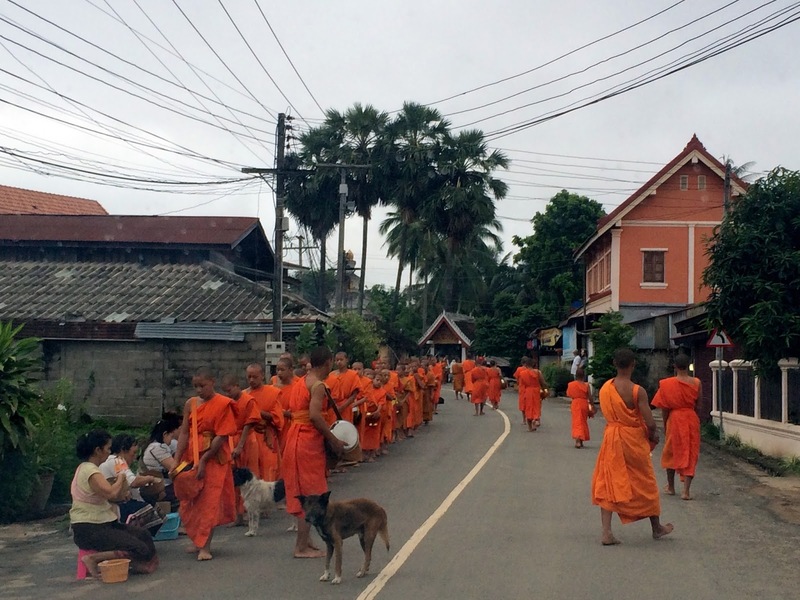 As my host drove me to the airport in the early morning, I caught the alms ritual taking place just outside the guesthouse. Kham explained it only the younger monks line up to gather their offerings on that street, as they came from a monastery 7km away that have taken in many children from poorer families. We drove past the bus that took them here, it looked like it was taken from a scrap metal garage. The children perform the ritual daily, return to the monastery for breakfast before going to school. The ritual is more for the benefit of the offerers, who believe they can connect with their family spirits via the monks. The preparation of food gain them merits for the future. The monks do not solely rely on the daily offerings, they get more elaborate donations at festivals and life events, as well as meals from local families. They don't eat after midday, and each meal is signalled by the drum. It was fascinating to watch, especially on a quiet street with no other tourists. Ending this short, but eventful trip on a high note. 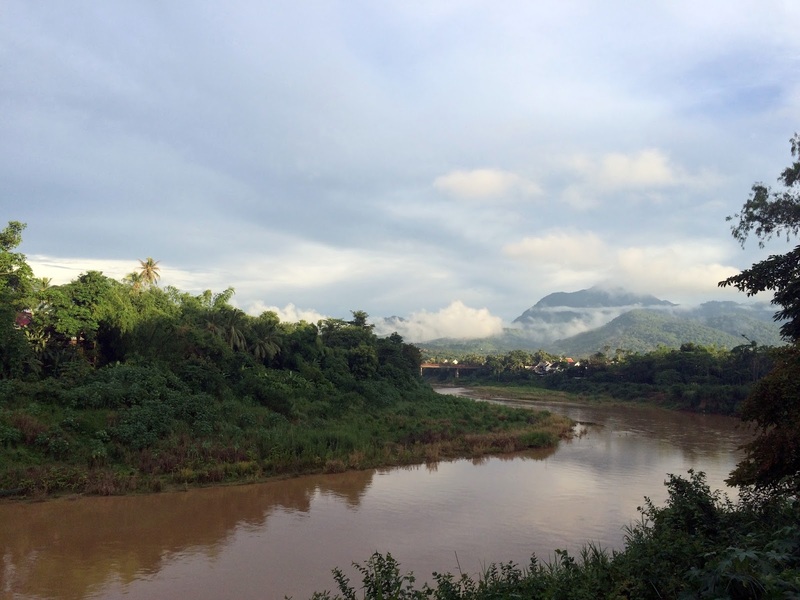 Luang Prabang was more scenic and charming than expected. I was initially skeptical and worried about a rowdy backpacker crowd and consequently a trashy town. I couldn't be more wrong. This, again, could be attributed to low season, as the main crowd I saw was young couples and family, but it was quaint and neat; the locals were not pushy; good variety of quality restaurants and prices were reasonable. I have no doubt it has already undergone massive changes from where it was 10 years ago, stripping out the authentic and untouched charm, but overall the progression seemed orderly. It's possibly one of the best towns I have visited in South East Asia. 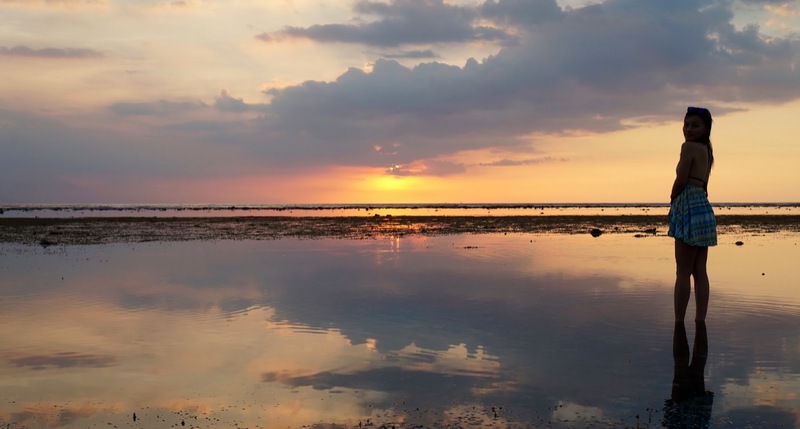 The original plan was to spend a couple of days diving around the Gili Islands, then an overnight trek up Mount Rinjani in Lombok to make the most of an extended weekend thanks to a mid-week public holiday. Then Mama Chan wanted to join, so diving time was significantly reduced and camping overnight on a volcano was off the table. 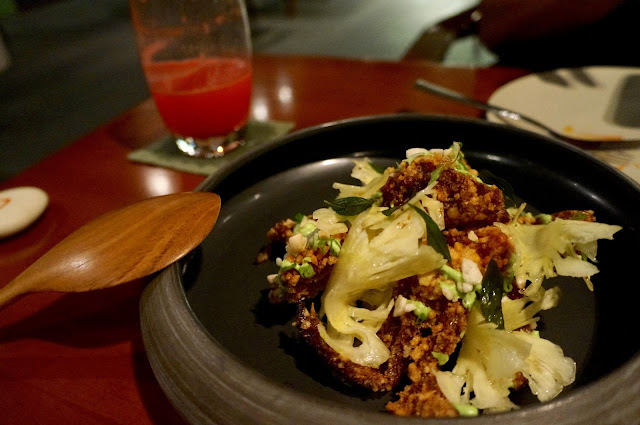 We landed in the evening and made the most of Bali by having dinner at Cuca. The next morning we were picked up by the ferry company to catch a fast boat at Seminayek pier. There are a few companies that organise private transfers to the 3 Gili islands; we went with Gili Getaway. The boat trip took 2hrs15mins. A rep from our villa greeted us as we got off the boat, but he was only there to tell us that the villa was a really long walk and that we could take a horse carriage for 100k IDR. Err… thanks. Google Map says it’s only an 18-min walk. The carriage took us on a detour that went pass a mountain of plastic and garbage, as well as a bunch of cows feeding on them. On a more positive note, it was Mama Chan’s first time on a horse cart. Mine too, I hope it was the last. 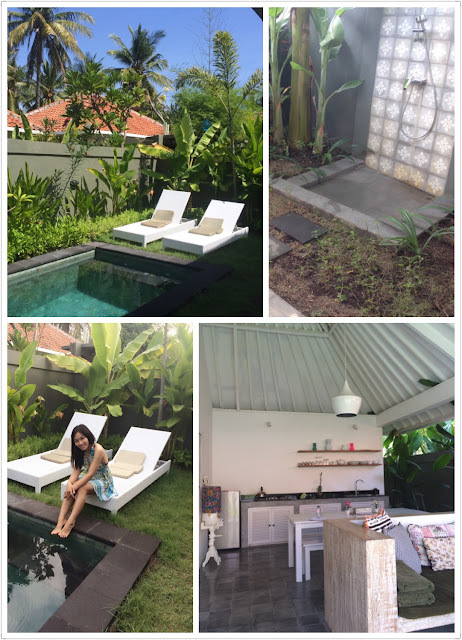 The villa was great with a private pool and an outdoor bathroom. I think they should tell the housekeeping staff to keep the bedroom door closed when they clean, because we spent half an hour swatting the flies in the bedroom. We rented bikes from the villa and made our way to town. Most of the roads were unpaved on the island, depending on rainfall, the roads could be mushy, sandy or bumpy. Sometimes a bit tricky when cycling in town with incoming horse carts and as visitors arrive in batches. But overall it should be manageable even for novice cyclists, just watch out for sandy patches. We went to book for diving trips and snorkelling. Usually there are 3 dives per day but seeing it was Ramadan, some dive centres are short staffed, especially when locals tend to go to the temple on Fridays. I signed up for 2 morning dives with Gili Divers. All the centres have uniform pricing, so it was a matter of choosing one that you like the look of. Snorkelling trips generally depart at 10:30am or 1pm, 100k and 150k IDR respectively. 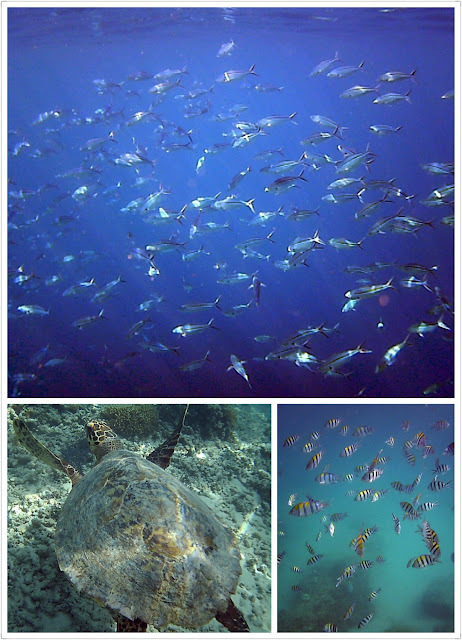 These 'public tours' last around 4.5 hrs, visit 3 snorkelling sites and finish with a short break on Gili Meno before returning to Gili T. Provided I come back from my second dive on time, we should make the snorkelling. Having sorted the activities for the next day, we checked out the town and marvelled at the abundance of cafes, bars and restaurants. We pushed through the crowd and continued our way around the island clockwise to the west side of the island, where there was a lower density of restaurants, but all with bean bags, swing chairs, trendy hand-crafted furniture and sun-loungers of shapes and sizes. The crowd thinned out on the west side too. We found the famous swings in the ocean, and there were quite a few of them put up by the hotels to attract customers at sunset. We almost made a full circuit and settled for Desa Dunia Beda Beach as it had most people. We later found out the people were probably just waiting for their food, which took over an hour to come out. Mama Chan doesn't need much feeding, she was apparently still full from the breakfast at the pier. Perhaps it was the sun, but I wasn't particularly hungry either. Sipping on our cocktails, we watched others wade in with their fins and snorkels (available to rent from the hotel) and chilled. Not the entire coast boasts a picture-perfect white sandy beach, some areas have much seaweed and prickly dead corals washed ashore, and the east coast is lined with moored boats. Generally the water was very clear with gentle waves good for swimming. Our food was ridiculous. The gado gado became cabbage wraps with carrots and beans, served with a pathetic portion of peanut sauce; Mum's fish and chips was wrong; it was fish nuggets made with a mackerel-like fish. They failed on both local and international cuisine. On a separate note, Mama Chan feels obliged to order fish & chips on every beach holiday, yet frown upon people having pizzas. Any ideas? The low tide at sunset means we could walk far into the ocean, where it formed a beautiful mirror of the colourful sky. We had dinner at the night market, just next to the jetty. There were various stalls selling bbq seafood and skewers, though nothing looked particularly attractive, just very standard cheap fare. The stall furthest to the jetty had the longest queue - each skewer was charged at 30k IDR. After choosing from the selection, we were given a ticket. About 20mins later we went back to choose 3 types of vegetables to go with rice and pick up the skewers at the end. 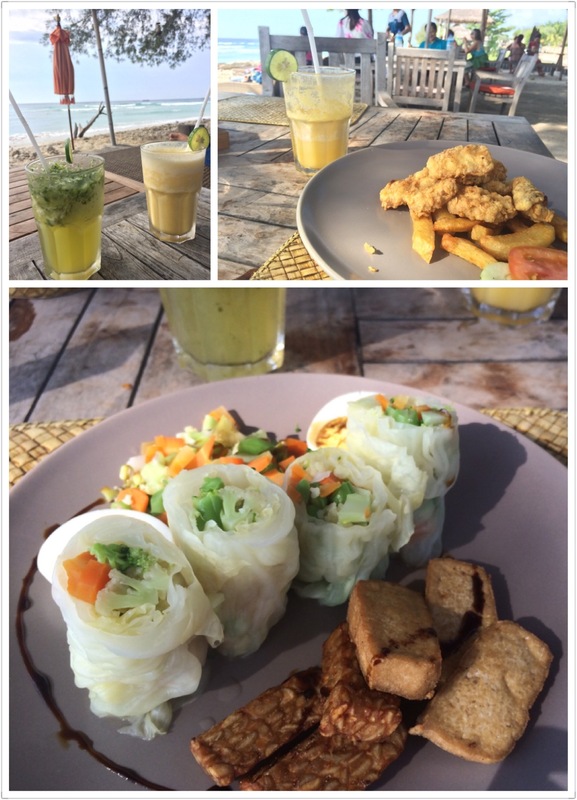 We enjoyed the calamari and complimentary veg, fish was overcooked to a parched, sinewy lump and chicken was raw. Meh. I was hoping to see manta rays at Manta Point, unfortunately it’s a rare sight in Gili, apparently I'd have better luck in Bali. 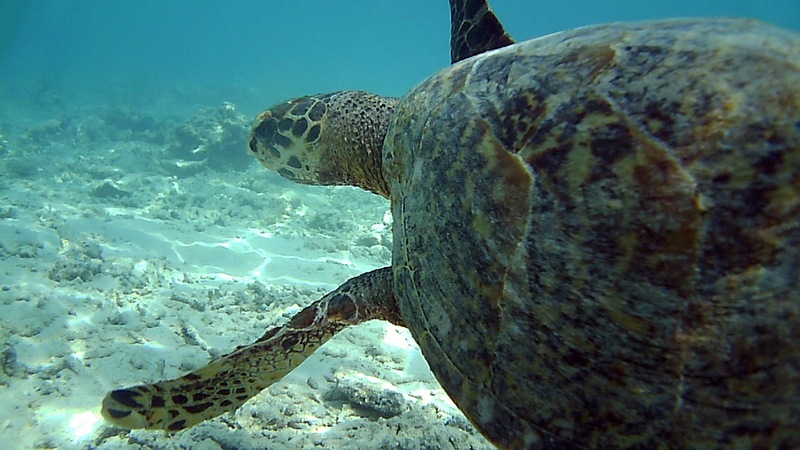 And there were no sharks at Shark Point… lots of turtles though! The snorkelling trip in the afternoon was good fun. The boat was packed, mostly with local tourists. 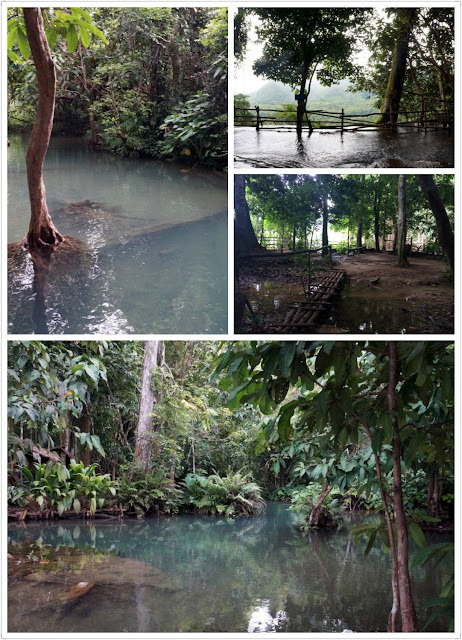 Unlike Maldives, we were left to our own at each site, Mama Chan didn’t get her personal guide this time, just me - then again, we’re paying a tenth of the price. 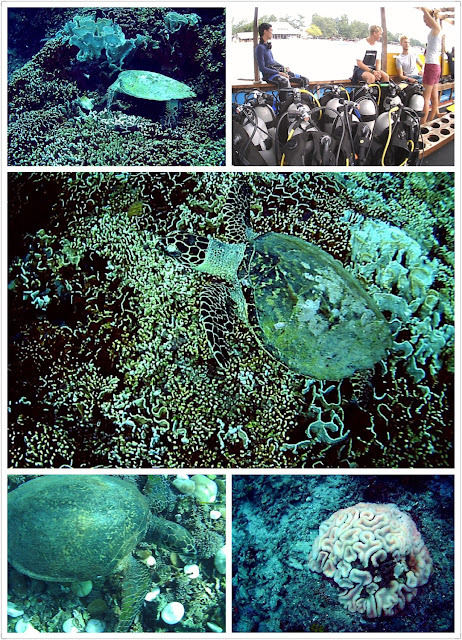 The first site was very thin on corals, but we saw a turtle only 2 metres deep, the closest Mama Chan had been to one. I tried to take a selfie with it, but gave up as I didn’t want to stress him out. The third site near Gili Air had lots of fish, partly because the guide kept throwing bread into the water, which is really bad for the ecosystem. There are slow local boats to Lombok at the harbour, they leave as and when they're full (min.20). On the day the boats were constantly filling up and moving - ticket costs 15k each. It’s a 25min boat ride to Lombok Bangsal, from there we got a taxi for 150k to our resort in Sengigi. There are kiosks along the main street that organise trips to Sengigi directly for 150k each. All they do, is that they put you on a slow boat, then have a shuttle bus at Bangsal to take the group to various hotels in Sengigi. There are also fast boat options at around 300k. We took it easy in Lombok, mainly just chilled in the resort hotel and made use of its pool. Sengigi beach is quite ugly and there wasn’t much to do at Sengigi town. However it did offer a stunning sunset with the view of Bali's Mount Agung. We ended the day with dinner at Asmara for a Sasak Rijstafel, a tasting menu adopted by the Dutch from the Indonesian feast. The dishes were generally very spicy. After a hearty breakfast and a blissful spa at the resort, it was time to leave for the airport. The DAMRI bus to Lombok airport leaves Sengigi every hour (35k IDR), took about 1.5hrs. 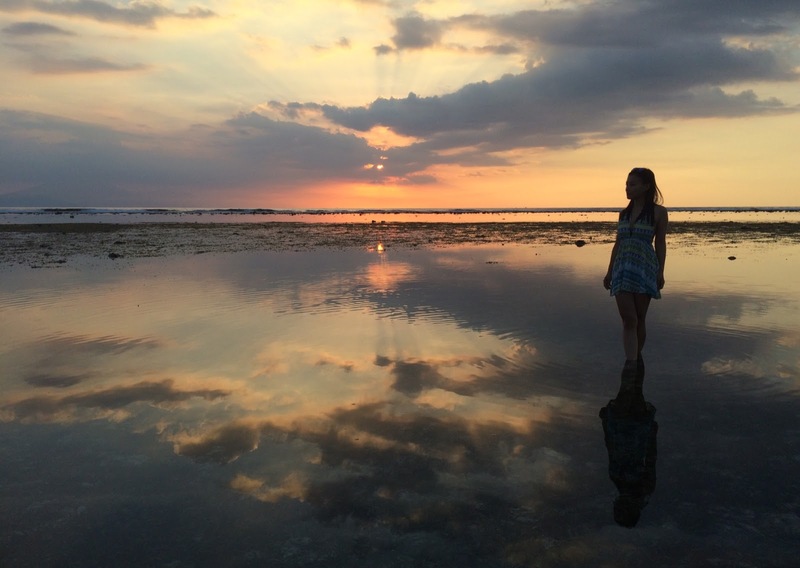 Even for the beginning of July, Gili was surprisingly quiet. Lucky for us, the party crowd was quite subdued so we didn’t see crazy parties and much of the aftermath. I wish I had the time to do the Rinjani overnight trek, but that’s okay - It’s been a very relaxing holiday. 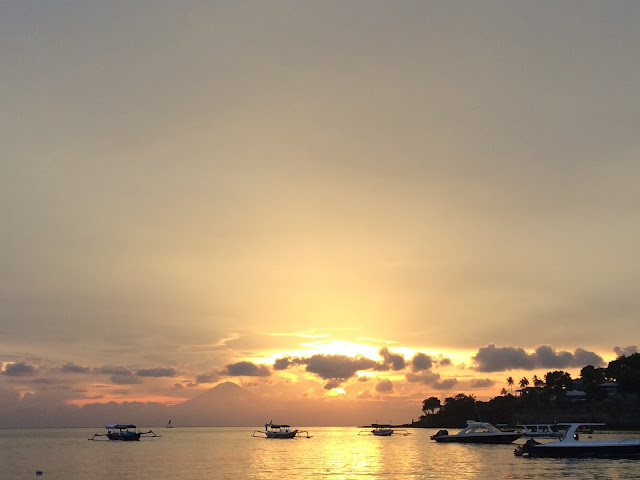 We had one evening in Bali before taking the fast boat to Gili Islands the following morning. 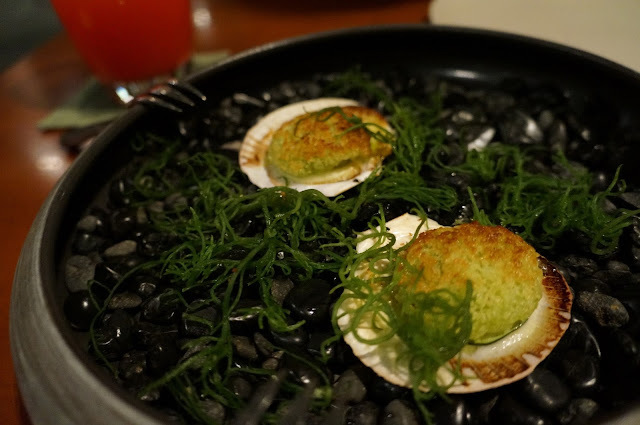 I was told that Cuca Restaurant has been talk-of-the-town serving spellbinding tapas led by Chef Kevin Cherkas, who has Arzak and El Bulli on his CV. Sounded like the perfect place to kick off our holiday. 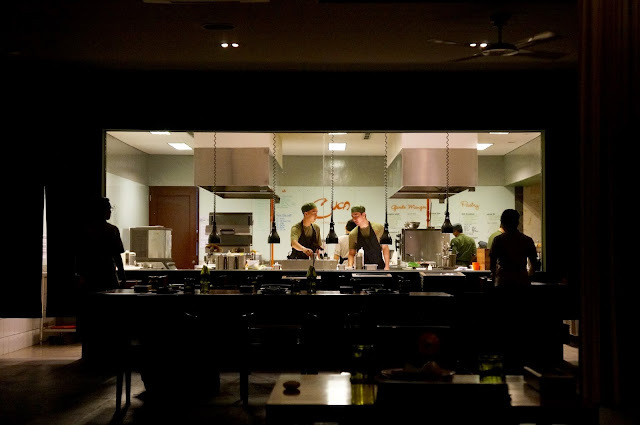 Initially we made our reservation for the bar seats so we could see the kitchen in action. However the bar was sweltering, as the aircon couldn’t reach the end of the counter. Our server happily move us to the main dining room, which was spacious and elegant with draping curtains. The cocktails were exquisite, but in presentation and flavours. My Bali Mary made with tomato water and citrus juice were lighter than the conventional bloody mary; Mama Chan’s Blush made with fresh watermelon juice and rosemary perfume was playfully served with an ice lolly. It was like a breath of pickled lemon with sour plum seasoning, the skin of the delicate bubble dissolved away instantly, leaving a powerful combination of flavours to awaken our taste buds. The scallop was just cooked to retain a soft creamy centre, with a gentle crunch from the butter-soaked crumbs, served on a bed of velvety cauliflower puree that intensified the sweetness of the shellfish. Simply delicious. 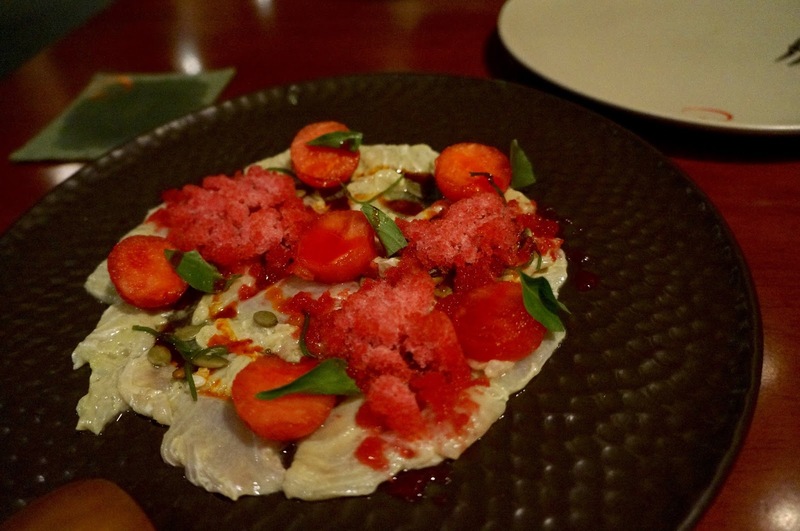 It looks quite different to a usual ceviche; I wasn’t expecting so much watermelon. The raw fish was mildly cured with lime juice, together with the juicy watermelon balls, the sweet and sour flavours were stimulating. I didn’t notice the heat from chillies but there was enough going on on the plate. This was delicious. 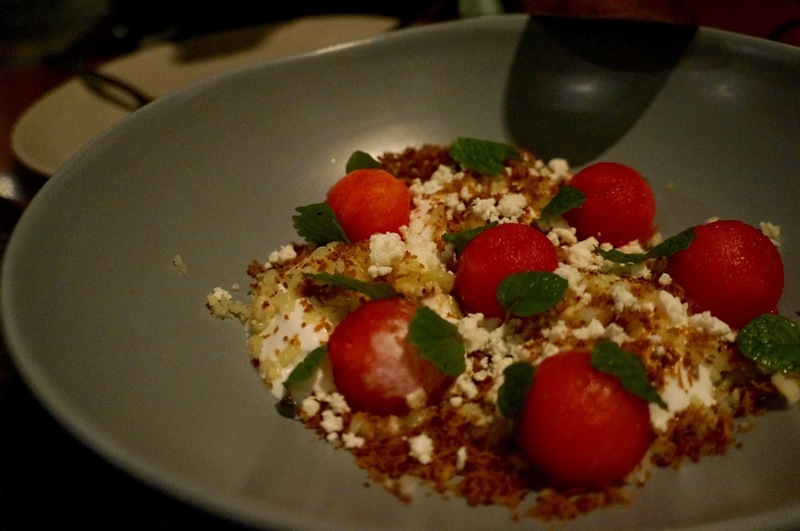 The bed of coconut mousse was airy but creamy, sprinkled with crumbles of feta, fragrant shreds of toasted coconut and sweet spheres of watermelon. I loved it when I was first introduced to pairing halloumi cheese with watermelon, and feta works equally well as the fruit juice softens the rubbery textures of the cheese. One of my favourites of the evening. The soft shell crab was made ultra crispy with a puffy rice coat with generous seasoning. It was a dish of familiar flavours made better with the sharp wafers of pineapple that helped to take the edge of the grease. The chunks of octopus were impeccable - soft and tender with bounce. 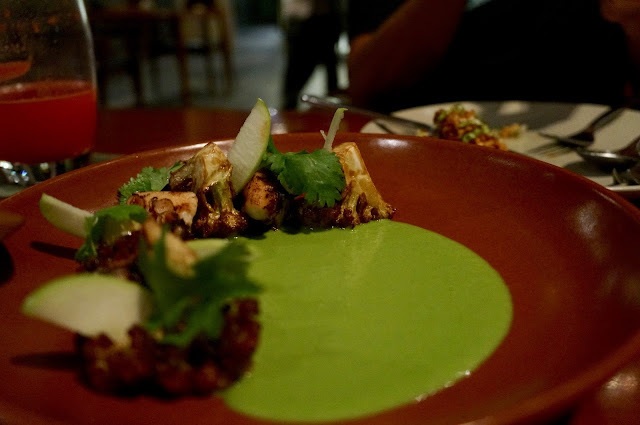 The glazed cauliflower and tangy apple slice complemented the smoky aroma of the octopus beautifully, finished with the velvety savoury couli. The pulled pork was hidden beneath the stack of potato strings, slow cooked to shreds of meat, clung onto a rich gravy. The shoestrings fires were abundant, but the potato component was missing, so a tad too harsh and dry; there wasn’t enough of the runny duck egg yolk to soften them. It got better when mingled with the meat gravy at the bottom, to resemble chilli fries. Compared to the more refined flavours of the other dishes, this was somewhat less impressive. There was definitely more mushroom than rice; it was bursting with fungi essence. A great finish to round off the meal. Cuca was delightful; each dish was well thought-out and crafted to showcase seasonal local produce with great attention to detail. The dishes were playful on tongue and pleasing to the eye. 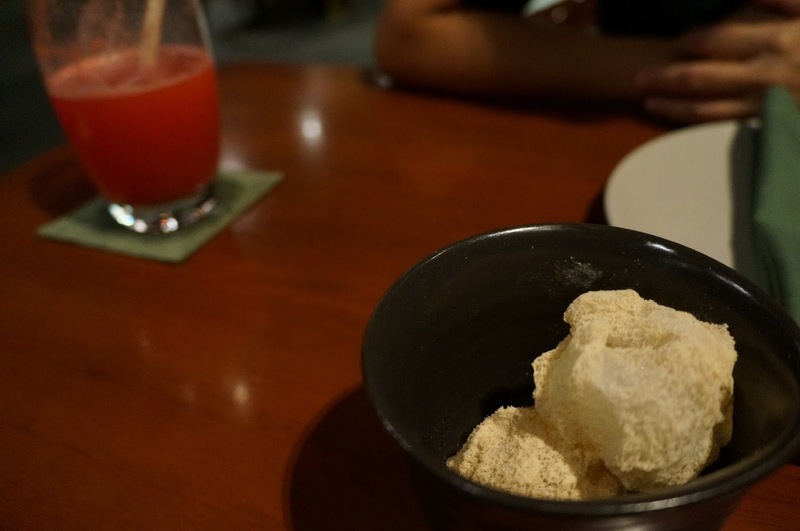 This blew a lot of the higher end restaurants in Singapore out of the water. Apparently Raymond Blanc turned up unannounced one evening, then tweeted that he’s just made the most exciting culinary discovery. That says something. 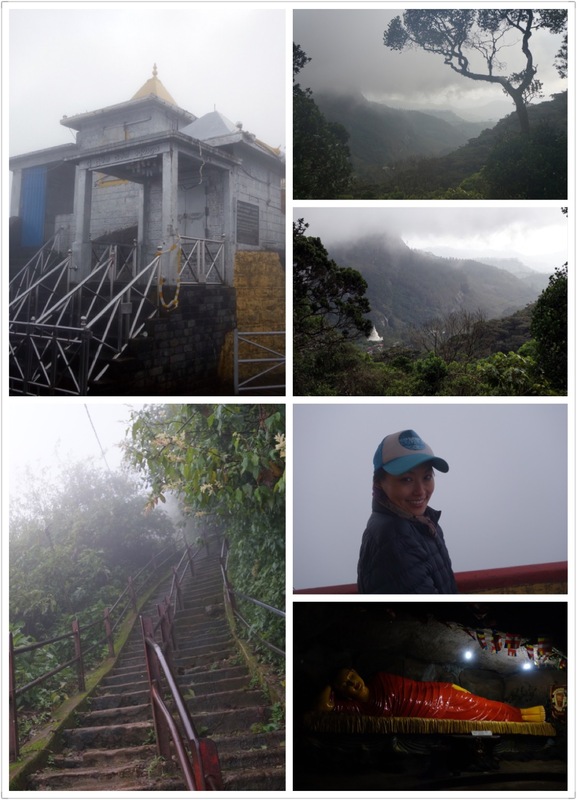 We left our guesthouse at 2am to start our ascend up Adam’s Peak. He asked multiple times if we should get more water the evening before, and for some obscure reason I expected the small stores to be open in the middle of the night. Well, I was wrong. With a little less than 750ml of water, we climbed. 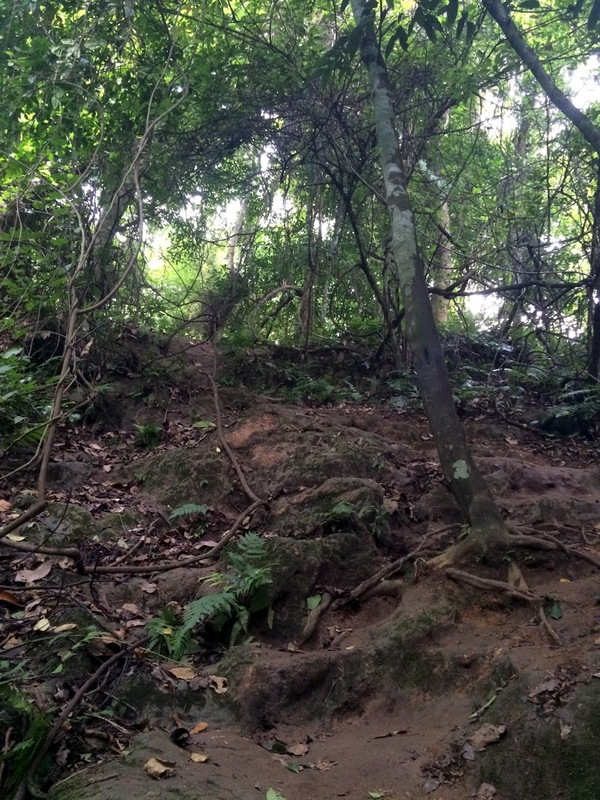 The police officer warned us to ignore all donations requests on our way, and told us to be careful as the entire trail was dark during low-season. The total distance was 7km and there was a police post every 1.5km or so, but I think most of them were unmanned. The first hour was relatively unchallenging, then the stairs got steeper and less regular, the air got denser with fog and the wind got much stronger. Our pace slowed and we started taking small breaks between flights of stairs to catch our breath. About 1hr45m in, we guessed we were half way through. But 20mins later we arrived at a closed temple gate and was told that we had arrived at the peak! It was 4:10am and we made it just under 2 hours 10mins! Oh dear it was going to be a long wait for sunrise. There was an abandoned room next to Sri Pada with a couple of broken bunk beds (and a rat that was rummaging through what was left of a mattress), we huddled with another group that had arrived before us. We were soaked through by a combination of sweat and fog. As our body temperature started to cool, I started shivering in the damp cold air. Later we moved to the basement of a larger room, where a chap was doing good business offering tea for 100 LKR each. It was life-saving tea as my lips were starting to turn blue. Needless to say there was no sunrise on the ultra cloudy morning; visibility was under 5m. We lingered until 6:10am and decided to make our way down. It was quite amusing to see the trail in daylight. Our descend took a little longer than we expected, as we took time to breathe in the views. After freshening up and a substantial breakfast at the guesthouse, we made the 9:20am bus to Hatton. There was a bus to Hatton at every hour after this one, but they go into Maskeliya which adds another 30mins to the trip. We wanted to catch the 11:18am train from Hatton to Ella; the bus reached Hatton at 10:55am. We briskly walked to the train station, he went to buy train tickets as I grabbed snacks at the Food City nearby. The mad rush really was rather unnecessary, as we should have known that the train would be delayed, by about half an hour. There were only second and third class on this train, with no seat reservation. 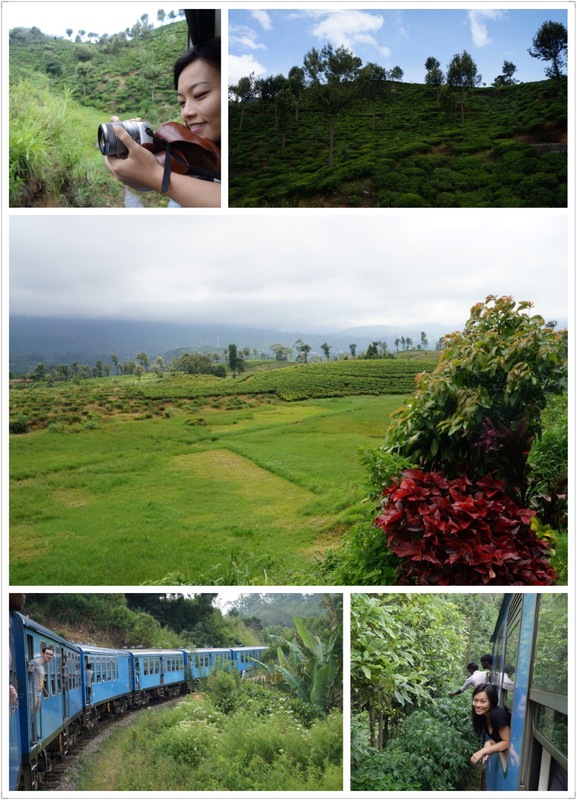 We didn’t manage to find seats in the second class carriages that we paid for (160 LKR), and could have lingered at the open train doors for an unobstructed view of the rolling landscapes of tea fields. The staff managed to find us a couple of seats in third class, in exchange for a tip; there was very little difference between the two classes. It was a shame we didn’t get a window seat, as the journey between Hatton and Nuwara Eliya was very scenic. We arrived at Ella after the 4.5-hour train ride. There were definitely more foreigners than locals in Ella; it’s very much a backpacker town. The tiny town centre was lined with cafes that served lattes and sandwiches and guesthouses with sports TV. We found an eatery that didn’t have some hip English name, and chowed down a Lump Rice (lumprais), which was delicious because it was pretty much rice & curry with a fried egg, served piping hot, and some lukewarm rice & curry. 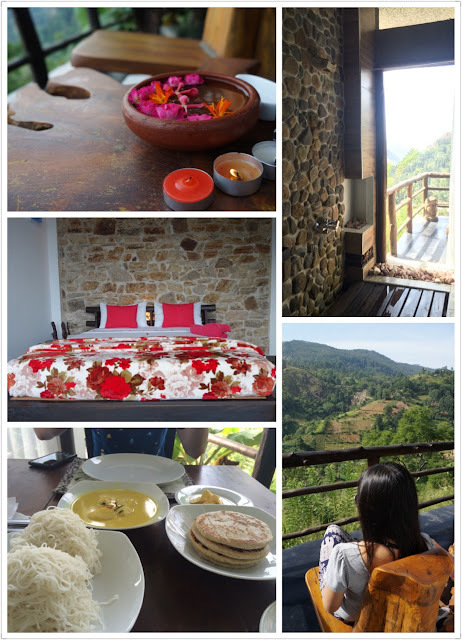 We booked a guesthouse called Romance in Ella, which was an uphill drive 2km from the town centre, hidden along a very steep and bumpy side road. Our host, Sanjee, greeted us and showed us to the one and only room on site. 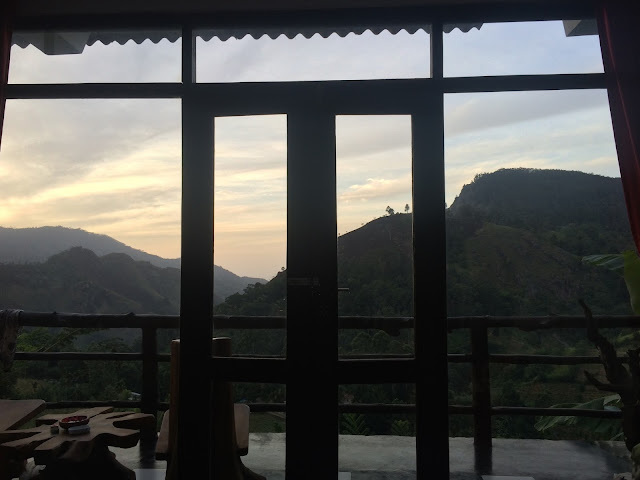 The room featured a glass wall that overlooks Little Adam’s Peak and Ella Rock, and beautifully crafted furniture. Sanjee brought us tea on the balcony and explained that we could walk along the train tracks to the mini waterfall across the valley. And so we did - a kid showed us the way to climb closer to fall. There was only 1 local restaurant within walking distance of the guesthouse, and it closes quite early as it was in the middle of nowhere. Good thing we had eaten around 5pm and didn’t feel we needed to get back into town for dinner. We left the curtains open at night so we could wake to sunrise, apparently one could see fireflies - I wouldn’t know, think I blacked out the moment my head hit the pillow. After our delicious string hoppers breakfast on the balcony the following morning, we lounged around before making our way to Udawalawe. There was no direct bus, so we had to change at Wellawaya. It was quite confusing at Wellawaya, some were trying to convince us taking a tuk tuk, while others pointed us to random buses or just a crowd in the bus terminal. So we just jumped on a bus that went to Thanamalwila and hoped to head west from there. We later found out that we could have waited for the bus bound for Colombo from Wellawaya, as this was the exact bus we had to find in Thanamalwila anyway, where it made a pit stop. We arrived at Nature House just before 3pm, and hopped straight onto the host’s jeep for an afternoon safari with the whole jeep to ourselves. My very first safari too! Our driver was remarkable at spotting all kinds of birds and animals. We found plenty of elephants but sadly no leopards. 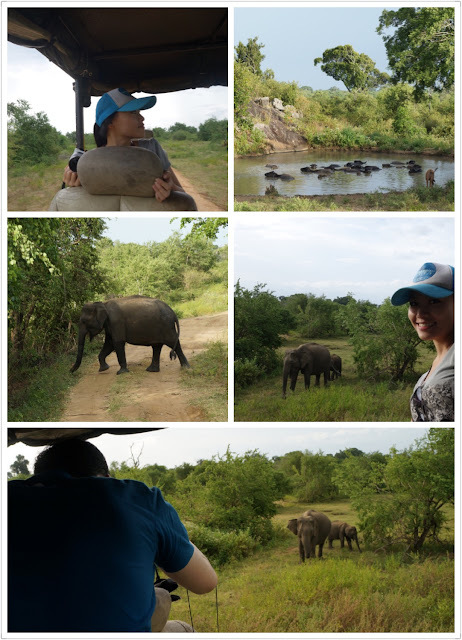 He said the Sri Lankan elephants were more domicile that African elephants, which tended to charge at jeeps. An elephant was just casually strolling across the road as we were leaving the park, as if to say goodbye. There wasn’t much to do in Udawalawe except for the park, only a few local restaurants that served food heavy with salt and MSG in the evening. We tried walking to the village centre on the east side of the road, but gave up after 40mins. The following day was the Poson Full Moon Poya public holiday, our host warned us about infrequent bus services and most shops and restaurants would be closed across the island. We had to make our way to Tangalle; first to Embilipitiya then changed for a Matara-bound bus. True enough we’d had to wait for 20mins or so for a bus, and the streets were flooded with people queuing for free food and temples were packed. 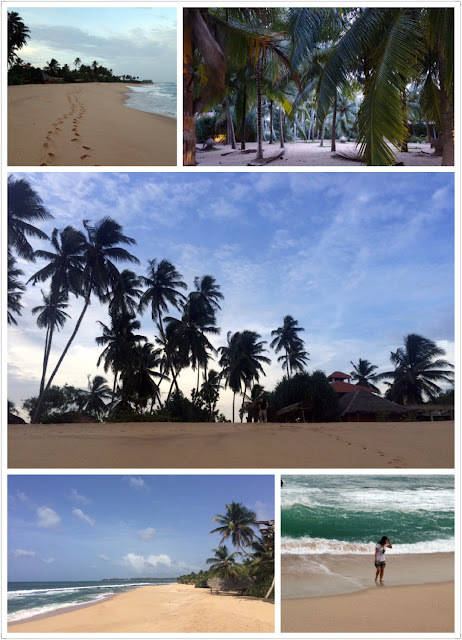 We walked for 20mins from the main road to Hideaway Lodge near the beach, and the hope for an ATM nearby was diminishing by the second as it felt as though we were the only people in the Tangalle beach area - low season and public holiday. We had the whole resort to ourselves, actually, we had the whole beach to ourselves. Our host said we had to go into Tangalle town for an ATM - well, with 800 LKR cash to our name, we didn’t have many options. Tangalle town centre was about 5km away. 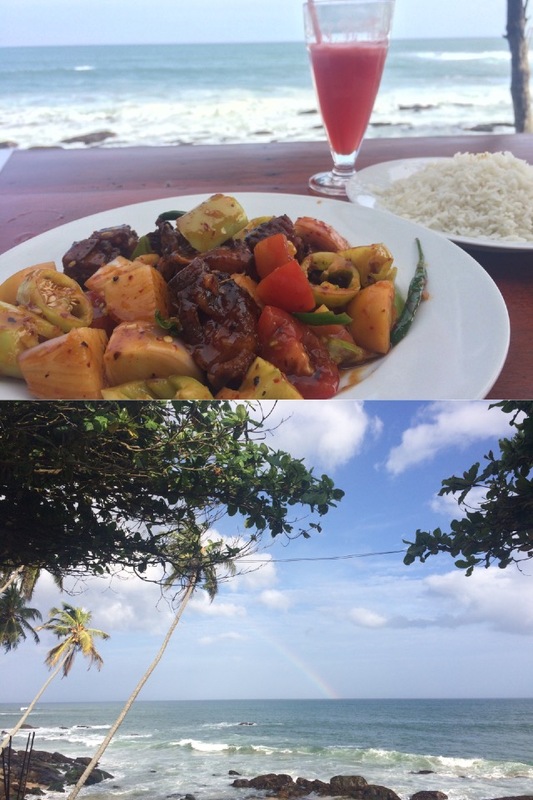 We found a restaurant by the sea for some late lunch and tried devilled fish for the first time. It reminded me of sweet & sour dishes with a kick. We strolled around town and saw the busy temples filled with locals making their offerings of flowers and candles. The locals were most welcoming. There were lots of festive stalls setup all over town, and the locals insisted we try their herbal tea called ‘belimal’, which was very soothing to my sore throat. We even picked up a couple of free ice creams! The sun was starting to set when we returned to Tangalle beach. It remained completely secluded. All the hotels and restaurants along the beach seemed to be closed, so we returned to our villa resort for dinner. We were certain food was made to order, we waited for about an hour while the entire villa crew worked away in the kitchen to whip up dinner for us. It was almost like he booked out the entire resort just for us; well worth the wait too as It was one of the better dinners we had. The beach remained secluded in the following morning, and the waves were still aggressive. By aggressive I mean it dragged me into the sea when I was standing calves-deep in the water. Before I realised what was happening, he was already carrying me away from the waters… I think he saved my life. So with an earful of sand and two pairs of sunnies short, we hopped on a bus to Unawattuna (c. 3hrs). Weather took a turn for the worse on the bus; it started raining hard and was still spitting when we jumped off the bus. We tried to find something to eat in Unawattuna town, but the only one we found was genuinely horrific. I went through the kitchen to use their toilet and it was impossible to see where the trash began and the food began; it was likely walking through a thick cloud of flies with visibility of half a metre. We just paid for a fanta and ran out of it. Eating at the guesthouse was a much safer bet. We spent the afternoon walking around Galle Fort. There wasn't much to see… the museum of old things was quite cool though. It was an early start to the airport from Unawattuna. The express bus left Galle at 6:30am, got us to Kadawatha. From there a local bus for 30mins to Wattala and then Bus 187 to the airport. It was a good 3.5hr trip. This itinerary took the express way on the initial leg, saving 45mins or so. Alternatively we could have taken the local bus to Colombo Fort for the first leg, then change for the Airport Express Bus that takes the high way to the airport. We were worried about traffic near Galle in the morning though. Even after 11 days in Sri Lanka, I can’t articulate any highlights that the country has to offer - I am not sure if there is any. I felt the best part of the trip have been the bus journeys on the various third-hand buses, even better when it’s not blaring with Sri Lankan music. The people had been incredibly hospitable, genuine and kind, we were greeted with friendly hellos everywhere, and most of the people we met were helpful with honest answers instead of trying to con us into a tuk-tuk. This alone made the trip enjoyable and stress-free. And as always, he made the trip wonderful. While the country itself is not particularly romantic, the pure solitude of travelling in low season had a natural charming air to it. Thank you for looking after me. And saving my life.